It would be difficult to prove the negligence of physicians by the patient because of the professionality, unexpectability of medical treatments and the assignment of responsibility at lawsuits. Therefore, it would be a tendency to prove the responsibility of physicians that the informed consent which has less relationship to medical professional judgments didn’t be fulfilled. According to the law in force and legal practice, the objects to the informed consent wouldn’t only be the patient, but the legal agent, the spouse, family members and any other relatives as well. Even though the legal opinion as it concerned a certain interest at legal practice, it still has a conflict with the patient autonomy, especially for juveniles. 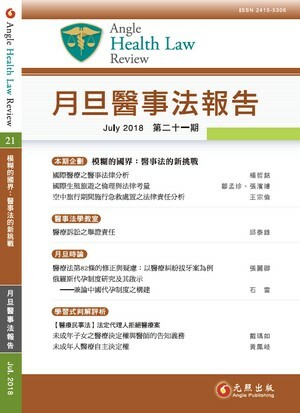 In order realize the patient autonomy, Patient Autonomy Act had been enforced in 2014 in Taiwan. According to it, focusing on the rights of patients and guaranteeing the patient autonomy, it is regulated that the relatives shall not intervene the patient to make any decision. Furthermore, the patient has the priority to be the object of informed consent. Insofar is Patient Autonomy Act, with positive and negative norms, an advanced regulation.